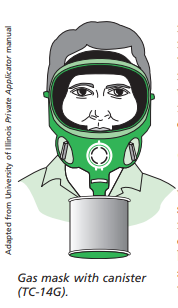 Air-purifying respirators are more commonly used when handling pesticides. They filter the ambient (surrounding) air using filters to protect against par­ticulates, or cartridges and canisters to protect against gases. Atmosphere-supplying respirators provide clean air to the user from a tank or compressor, and are more expensive. Tight-fitting respirators must have a tight seal between the respirator facemask and user’s face and/or neck. Examples of tight-fitting respirators are particulate filter masks, full­ face masks, and half-masks. If the seal leaks, contaminated air is pulled into the facepiece and inhaled. Facial hair such as a beard or stubble that could interfere with the respirator seal is not permitted. Piercings, stray hair, and clothing may also interfere with the seal. For the Worker Protection Standard, a fit test must be performed for any tight-fitting respirator at least every 12 months to make sure that the facepiece makes a tight seal. Situations such as weight gain, weight loss, or dental work that might affect the seal trigger the need for another fit test. A loose-fitting respirator, such as a hood or helmet, does not depend on a tight seal with the face to provide protection. These are options for those who have facial hair, or those who cannot find a respirator that provides a tight seal. Loose­ fitting respirators do not need to be fit tested. 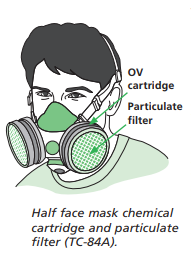 Three examples of air-purifying respirators are illustrated above. The gas mask (left) and half face mask (center) are tight-fitting respirators while the PAPR (right) is loose-fitting. The ‘TC’ followed by numbers and letters are NIOSH designations. See TC Numbers and Cartridge Colors for a complete list.